"Santa Marie, how beautiful it is!!!" Iguazu Falls defies clichés. 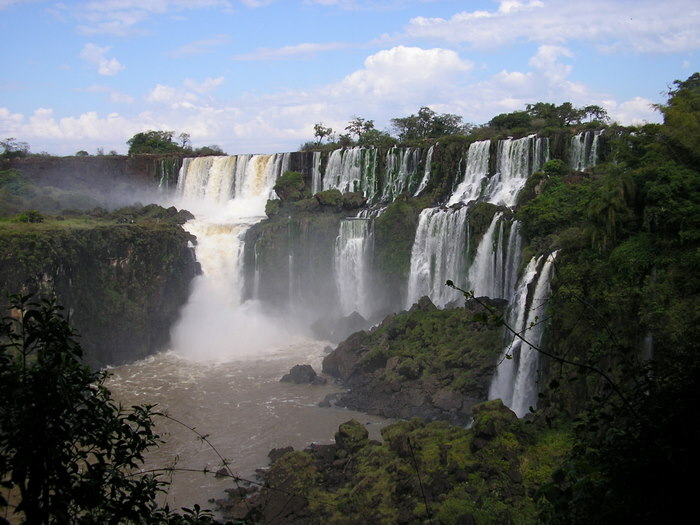 It deserves its position as the most visited sight in Argentina, and Parque Nacional Iguazu is superbly designed to handle the crowds. 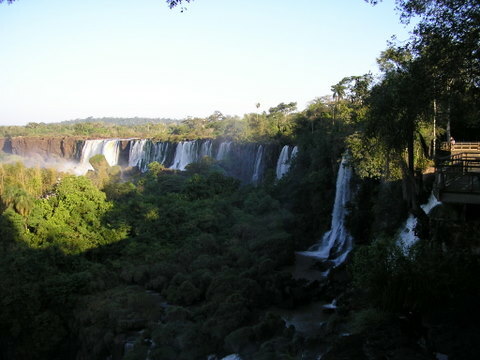 Iguazu is actually a system of 275 falls wrapping the cliffs around 1-½ miles of the Rio Iguazu. They range in height from 200 to 275 feet. 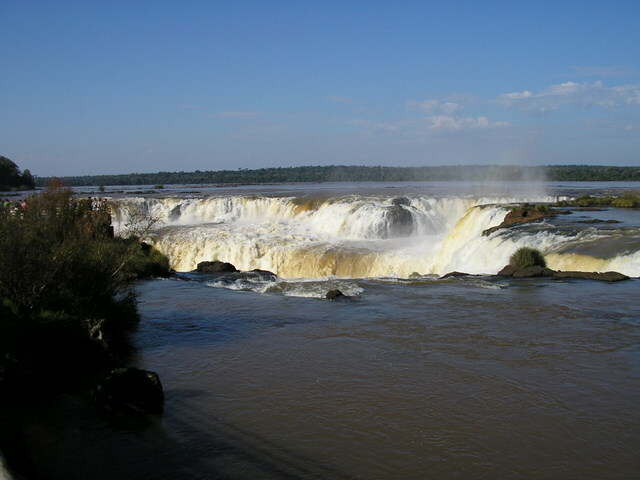 The center piece is Garganta del Diablo (The Devil's Throat). 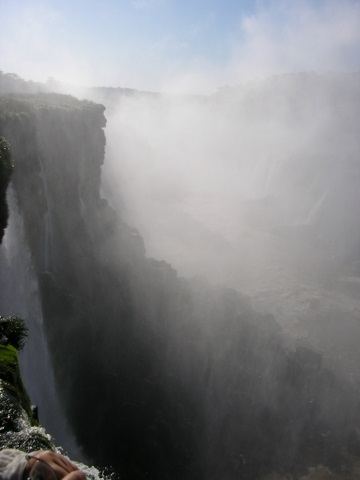 U-shaped, 270 feet high and 490 feet wide, its massive flow plunges with such force that the mist generates constant rainbows and makes seeing the base of the fall impossible. 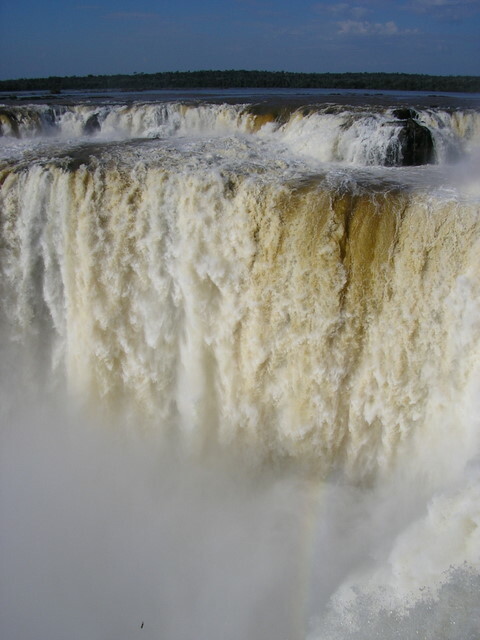 Two thirds of the falls are within Argentine territory and is the ideal side if you wish to get close to the full spectacle. 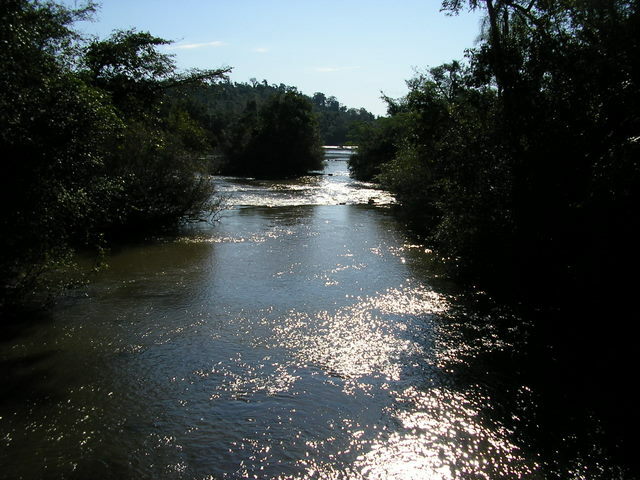 The Brazilian side gives a visitor a panoramic view of the entire system and is only a short bus ride from Puerto Iguazu. But that does not mean a visitor can go over to Brazil on the spur of the moment. If you are an American, or a citizen of several European countries, Brazil requires a visa that must be obtained in advance - best if done before arrival in Argentina. The fee for an American averages US$135. 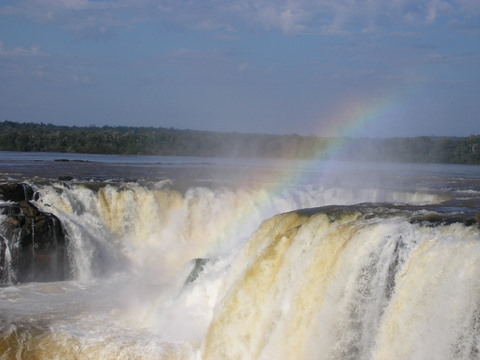 By all means, if you plan to travel within Brazil, then see both sides, but I would not recommend paying for the visa just to see the falls from their side. 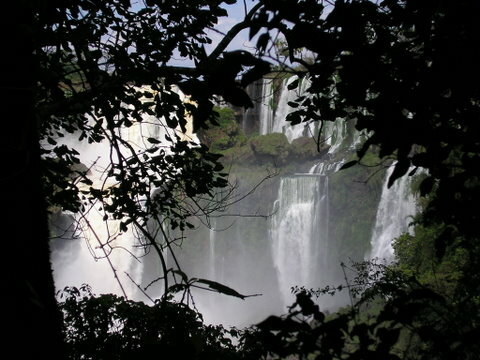 Parque Nacional Iguazu has an excellent system of raised wooden trails that wind through the jungle taking the visitor to both the base of many of the falls as well as to their tops. The photo opportunities are endless. The variety of animal life and tropical foliage simply adds to the overwhelming beauty of the experience. A taxi from your hotel to the park entrance will cost between AR$20 - 30 (US$5.25 - $8.00) but be careful on the return trip as taxis will routinely charge two to three times more! An excellent alternative is the public bus that travels frequently from the bus terminal, or catch it in front of your hotel on route 12, right to the park entrance for AR$2.5 (US$.65). 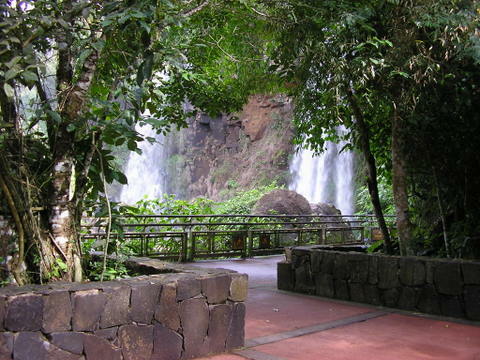 The entrance fee to the park for foreign visitors is AR$40 (US$10). You will receive a ticket, make sure that it is stamped, and keep it because it allows you to receive a 50% discount if you want to return the following day. 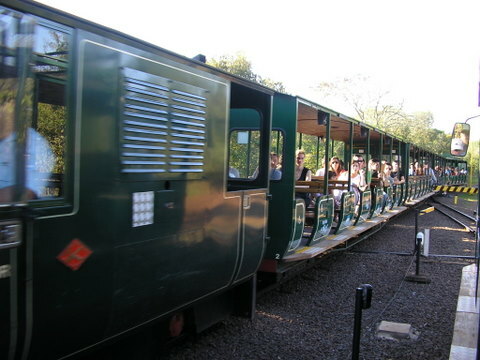 A short walk past kiosks selling various wares takes you to a railway platform where a narrow gauge train makes the trip to the two junctions for the trails. The first stop is at a well designed complex of shops and restaurants. Keep in mind that this is a tourist destination so prices will be higher than average, but in general the food is decent and it certainly makes a pleasant site to have a drink or lunch after your hike on the trails. 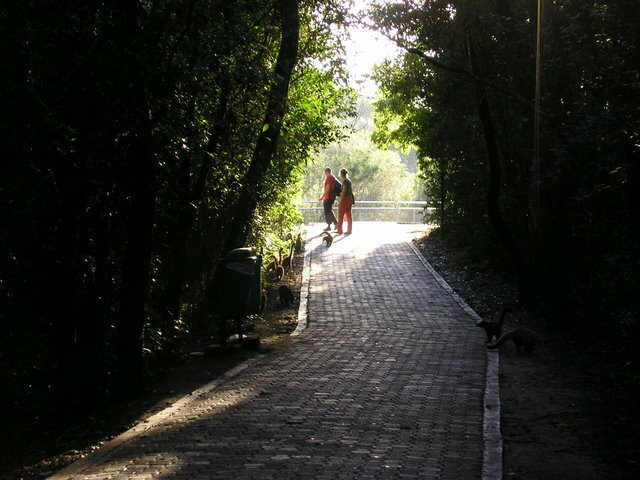 The main complex of trails also begins at this stop. 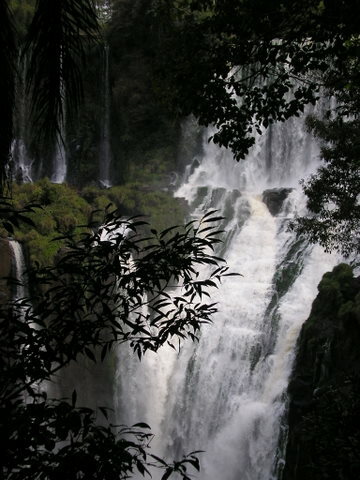 One series of trails descends the cliffs through the jungle to the base of several falls. Convenient sitting areas are situated at several stops to make the walk comfortable. A pleasant central location half way down the path provides restrooms, a sitting area and a shop to buy water, soda, juice and snacks. This trail is the only one that does require some exertion - especially if it’s hot and humid - it is not simply a level path. At the base of the falls there are boat docks. A ferry will take hikers to an island with trails that wind up its hill with views from a different perspective of the falls and, especially, the Devil’s Throat. 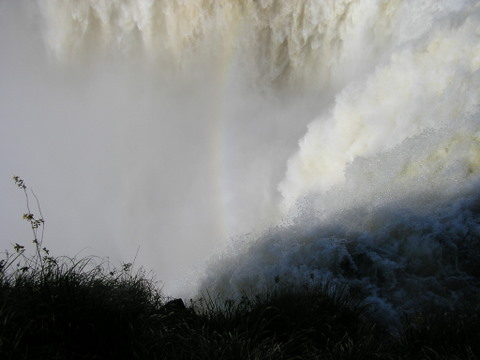 For a fee, boats will travel on the river within close proximity of the falls, including the Devil’s Throat. The main thrill is getting soaked by the spray but, unless your camera is waterproof, I think this experience is overrated. After returning to the top of the cliffs, another series of level trails takes you around the edge of the falls at their tops. Jumping back on the train, the second stop travels over one mile to the Devil’s Throat trail. This nearly one-mile wooden causeway winds on top of the immensely wide, tranquil Rio Iguazu and through three small islands. The landscape is otherworldly and the views of bird life are an ornithologist’s dream. 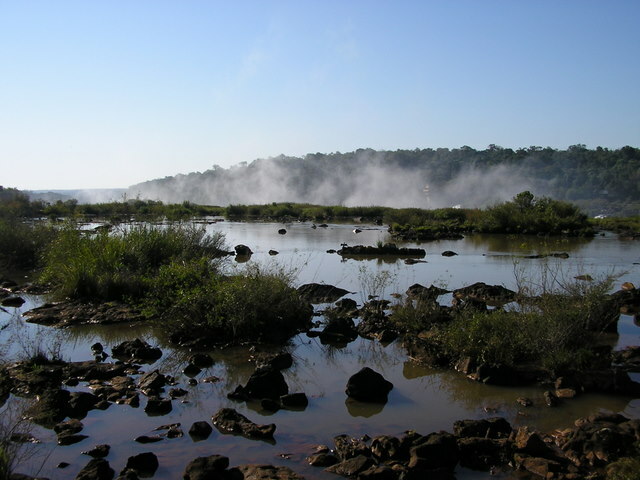 The sound of the Devil’s Throat grows ever louder and the first sight is startling because from a nearly eye level view it looks as if the river is simply spilling into a large hole. As the path turns a corner, the full might of the fall is an overpowering, and deafening, sight. 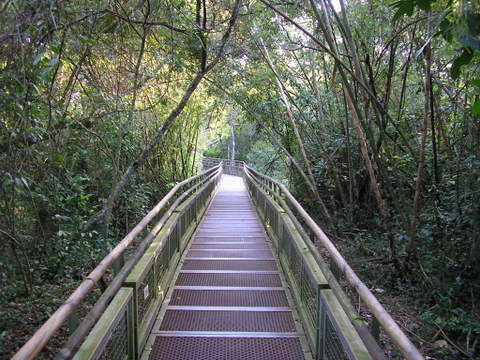 A fourth path winds several miles into the jungle for people who want to experience the full beauty of tropical plant and animal life. It is possible to take a guided tour with park rangers although all paths are well signed with information provided in several languages. 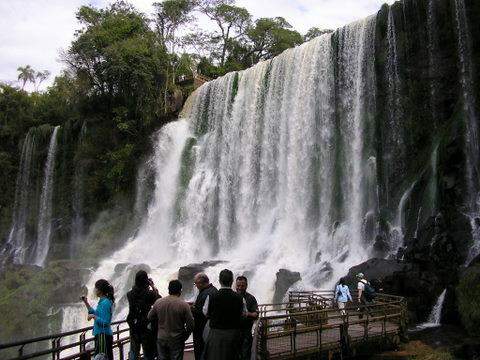 Many travelers to Argentina, with limited time, visit only Buenos Aires and Iguazu. Although that is certainly not the totality of this beautiful country, if there is time for only one trip outside the Capital, than visiting one of this earth’s great natural wonders is a lifetime experience.